If you are just making the famed switch from computer based online casinos to mobile casinos, you are more than likely to be confused about how to go about it. It’s not really difficult to find one’s way around mobile gambling but it must be conceded that the starter’s nerves are always there. To get over these nerves, Roxy Palace Mobile Casino has introduced some splendid bonuses for all new players. If you are already a registered member with Roxy Palace online casino, you will find no difficulty in registering for the mobile casino. If you are not, you will have to sign up for a new account. Once you have an account in place, all you have to do is make two separate deposits of £10 or more to your Roxy Palace casino account via desktop website or computer client. 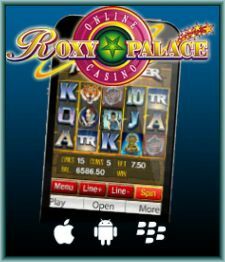 Once your deposits are through successfully, you will receive a special claim code with which you can sign up for Roxy Palace mobile casino. Signing up with this code will automatically credit 100% of your deposit amounts (up to £25) instantly in your mobile casino wallet. Furthermore, if you make a new deposit worth £25 or more to your mobile casino wallet, you will be eligible to receive up to £25 in 100% bonuses for the first three deposits. To avail this offer, you need to make two separate deposits of £10 or more on desktop website or client. Also, the claim code you will receive upon deposit, will be active only for 48 hours. These bonuses can only be availed by those who have a verified UK address.